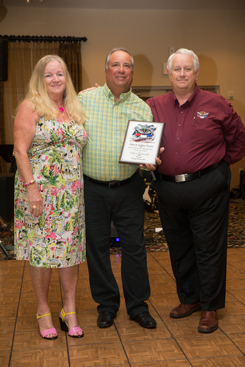 Mike and Debbie accept CCO's thanks from Lloyd for over 15 years of Selfless Dedication to the club! Promptly at 5:30PM Friday, our casual meet-n-greet kicked off on the Beach Cafe patio with appetizers and cash bar. Mike took the microphone and after opening remarks, honored all our members who’ve passed away. He shared touching and memorable stories about so many CCO members that are still dearly missed and we were all thankful for his remarks. Let the Games Begin! After breakfast on Saturday morning, Rena and Lorraine gathered all members on the sand directly behind the resort to brief us all on the rules for three group games to be played. Thankfully, seating for those spectating only was available in the shade of the hotel!! Our first game involved a no-hands-used passing of an orange held between chin and chest/shoulder to another partner, who had to grasp the orange the same way, then, turning to the next in line and repeating the hilarious escapade. Drop the orange? Both players in the attempted pass — disqualified and OUT! This game caused riotous laughing to the point of tears! Through process of elimination, our final winners were Joey and Elizabeth. The second game involved guys holding a plumbers plunger between their knees, handle pointing forward. Also a no-hands game, the girls had to pinch a roll of TP between their knees. Facing each other at distance, the guys and girls had to meet and somehow insert the plunger handle into the TP roll — the object seemed to have been that the winner would be the team that loaded the most TP on one plunger… No matter the rules, the screaming fun was in watching the moves made by the players while attempting to line their knees up with their partners! Steve and Darlene were our winners! Finally, a variation of the old musical chairs game was played with a circle of CCO’ers orbiting around towels laid down for each player, minus one. Music plays, the players rotated counterclockwise, music stops: Players rush to stan on the nearest towel. The player who does not have a towel to stand on is eliminated! Music plays and stops eliminating one player each round. Guess who won? In a dive to the towel fitting a baseball player’s lunge for home plate… Elizabeth!! After the games Saturday morning, the beach, the pool and Sloppy Joe’s were hit hard once again. But before we knew, it was time to make our way to the Chrystal Sands Banquet Hall to kick off our blow-out grand finale CCO 25th Anniversary Banquet with awards, dining and dancing to live music by a Central Florida critically acclaimed team of musicians - Cactus Jack and the Cadillacs!!! And what made this event even more unique, it was fully funded by the CCO Treasury from years of revenues generated by gifts from our members, fundraising projects coordinated by CCO volunteers and leadership, and generous sponsorship dollars generated by our website and homecoming participation. How many social organizations can match our commitment to giving back to membership? Not many! Opening remarks from Mike thanked many volunteer members and leadership by name for all their help over the years. Mike congratulated Tom and Maggie who were celebrating their 50th Wedding Anniversary! He then led into recognition awards for two of our longest active families, Bob & Georgia and Harold & Marjean - both members and fully involved since 1994! Lloyd presented Mike and Debbie with a plaque in recognition for over fifteen years of selfless leadership at CCO. Breeze announced the winners of the Anniversary Event Raffle - Rick and Rena, Joe and Jewel and Bob and Marcia! Dinner was served and the music by long time friends of Mike and Debbie - Cactus Jack and the Cadillac’s, got underway. Boy what fun Cactus Jack’s band is!?! This gang sure knows how to entertain. For three hours of “High Energy 50’s to 80’s” Hits with only one break, the Cadillac’s rocked CCO in fine fashion, We’ve never seen so many CCO’ers on the dance floor! We must thank new members Lee and Phylis for making a large gift that helped us bring this wonderful band of great musicians to Treasure Island! Well, our 25th is pretty much in the record books. While we won’t list them here, we have so many people to thank for their selfless contributions of time, effort and yes, dollars, to have made this year such a memorable one. Even though not named individually we know who you are! !